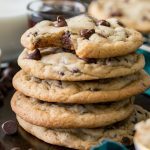 Thick, chewy cookie butter chocolate chip cookies! These are ridiculously amazing cookies with extra flavor from the addition of cookie butter. 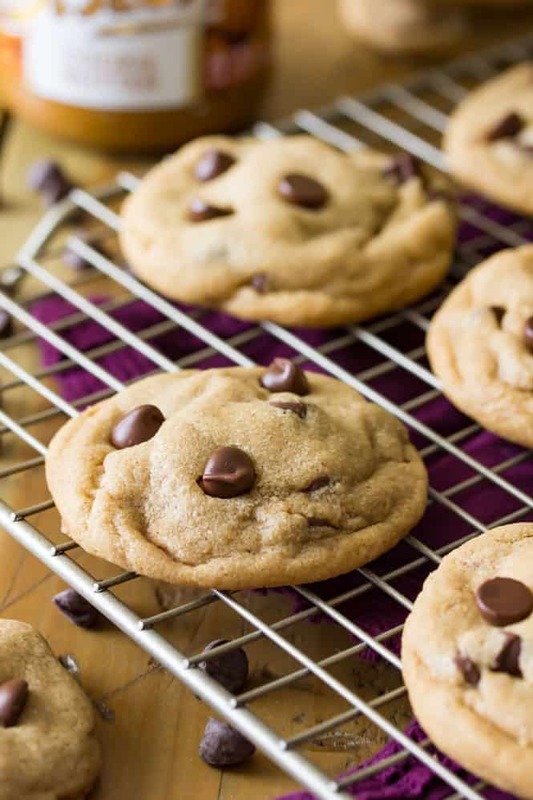 Top them off with extra semisweet chocolate chips for an unbelievably irresistible cookie! Raise your hand if you enjoy a really, really good chocolate chip cookie 🙋🏼. I know I’ve mentioned this before, but I’m a serious cookie addict in general, and a chocolate chip addict specifically. I already have my “Worst” chocolate chip cookie recipe that’s not just my personal favorite, but is also one of my most popular recipes on my whole blog, but this cookie butter chocolate chip recipe gives that one a real run for its money. These aren’t your classic chocolate chip cookies, though. These are made with cookie butter. That’s right, cookie. butter. 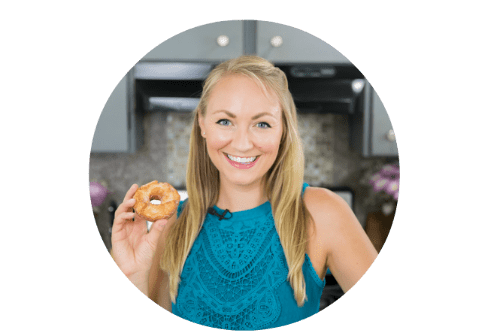 Have you ever baked with cookie butter before? It’s made from blended speculoos cookies, which are a Belgian spice cookie, and it’s absolutely, 100%, oops-i-just-ate-the-whole-jar-with-a-spoon, delicious. So yes, what we are doing is taking a “butter” made of cookies and baking it into a new batch of chocolate chip cookies. A sort of cookie inception, if you will. This brand of cookie butter comes in two varieties: creamy (pictured above) and crunchy (which is sold with a yellow lid). I haven’t tried the crunchy myself and recommend using the creamy version to make these cookie butter chocolate chip cookies. Please note that this recipe calls for just a bit more than a single (standard-sized) jar of cookie butter. If you only have one jar on hand, you can certainly cut the recipe in half, but I don’t like to go through all of that effort plus three hours of chilling (I know, I know!) for less than two dozen cookies, especially not for ones that fly off the cooling rack at the breakneck speed that these do. 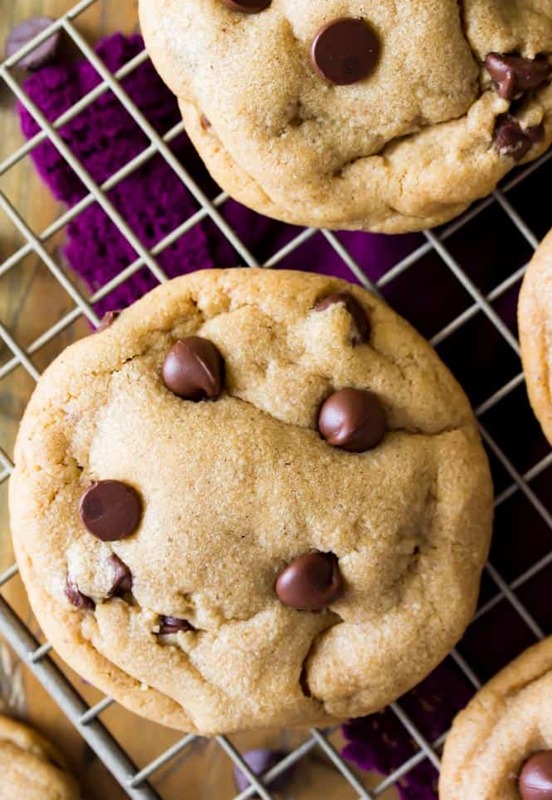 I adapted these cookie butter chocolate chip cookies from my favorite thick and chewy peanut butter chocolate chip cookie recipe. 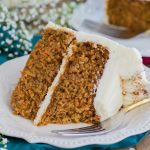 The result was thick, buttery, chewy (not at all cake-like) cookies with an incredible and unprecedented “secret ingredient” taste. The cookie butter taste is present, but it’s also subtle enough that the amazing taste is hard to place, and any unsuspecting taste testers might not be able to place their finger on it. Zach took these in to share with his coworkers (so that he and I wouldn’t devour all of them on our own) and told me that they got rave reviews. I enjoyed them so much that I made an extra batch just to freeze so that I can have a cookie butter chocolate chip cookie anytime I feel like it (this was either poor or brilliant thinking on my part because it’s put me in the very dangerous position of unsupervised cookie butter cookie dough access). And yes, these cookie butter chocolate chip cookies do require a few hours (!?! I’m sorry!) of chilling. I know, I too generally hate hate hate waiting for cookie dough to chill, but it’s a necessity for thick, chewy cookies. Once they come out of the oven, I think you’ll agree that the wait was worth it. Cookie Butter Chocolate Chip Cookies made with Biscoff Cookie Butter. 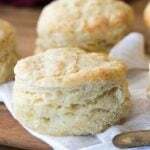 Combine softened butter, sugars, and cookie butter in the bowl of a stand mixer (or in a large bowl and use an electric mixer) and beat until ingredients are combined and well-creamed. 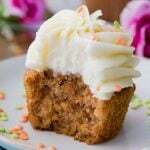 In a separate, medium-sized bowl, whisk together flour, cornstarch, baking powder, baking soda, cinnamon, and salt. 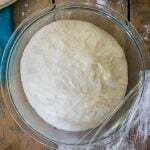 Gradually add dry ingredients to wet until completely combined -- be sure to scrape the sides and bottom of the bowl with a spatula to ensure that all ingredients are well-incorporated. Cover bowl with cling wrap and chill for 3 hours. Once cookie dough has finished chilling, preheat oven to 350F (175C). 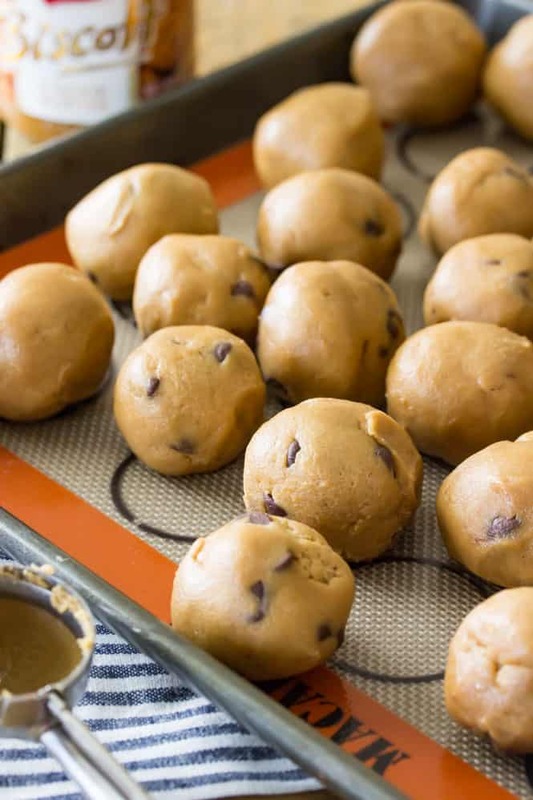 Roll dough into 1 1/2-2 Tablespoon sized balls of cookie dough and place on parchment paper or Silpat lined cookie sheet. Bake on 350F (175C) for 11 minutes. 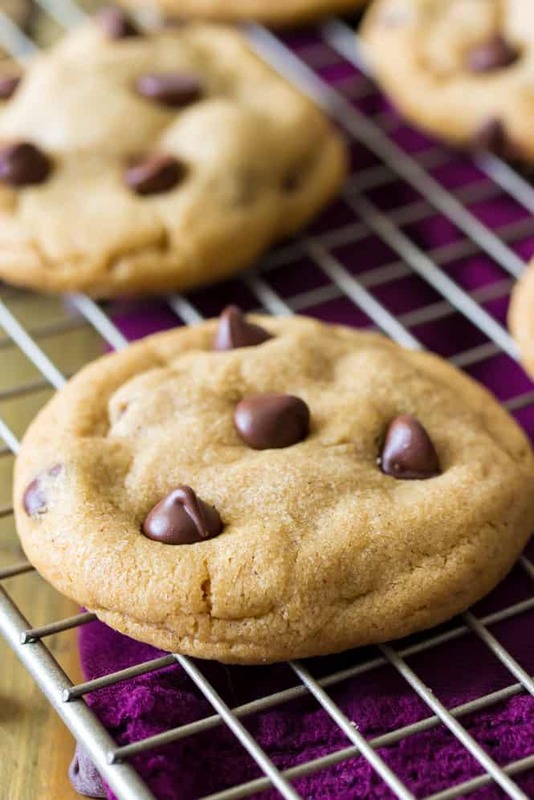 Once cookies are done baking, remove from oven and, if desired, within one minute of removing from oven top cookies with additional chocolate chips by gently nestling them into the tops of your warm cookies. Allow to cool completely on cookie sheet. 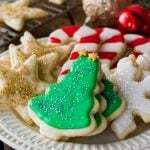 Keep your remaining dough in the refrigerator while each batch is cooking and do not place cookie dough on hot cookie sheet. Made two batches as instructed for a large get-together. They were a hit and made a ton of cookies. Noone could quite guess what the ingredient was-cookie butter! 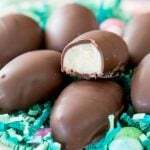 Will make these again. I love cinnamon, but if there are people who do not like a strong cinnamon taste, maybe cut down the additional cinnamon a bit as the cookie butter does have strong flavors in it-maybe cinnamon? 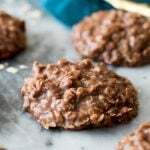 These were a fun cookie and do add choc chips on top immediately after baking! 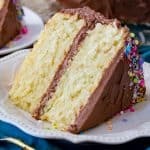 Easy recipe and great result but cook time 17 minutes not 11 . Hi Myfi, the servings on the label do not always calculate exactly. I’ve found on the label of my jar that even if you compare the serving size and the Net wt., a Tablespoon has to actually be heavier than the serving size suggests. When I make my recipes, I both measure them out in cups and weigh them out to be as precise as possible, and for me a cup and a half for me came out to 420 grams, so you can use either of those measurements and your cookies will turn out fine. I hope that helps! Okay! Thanks a bunch 🙂 I’ve got the dough chilling now, I’m so excited <3 I did a half-batch for now, if they're as delicious as I suspect they're going to be, I'll be bringing them to the family Christmas function! Cookies and patience. That is a difficult combination. I’ve never seen cookie butter before, what an interesting idea. It’s definitely difficult, for sure! Thank you, Stephanie!! 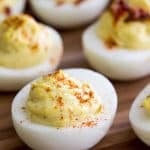 These look incredible Sam! 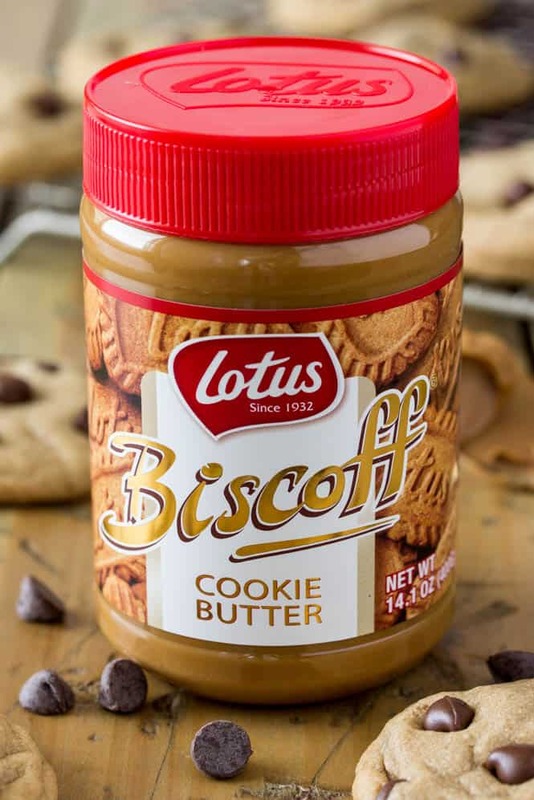 I am so bummed we don’t have cookie butter in New Zealand yet because I am dying to try it and bake with it! OH no! That is a huge bummer, hopefully they get some before too long, I really think you would love it! These sound really delicious and I will take your word for it. I made the “Worst” chocochip cookies from your recipe and you were right about those! Loved them. But, I bake and cook a lot and I have never heard of cookie butter. Where is it in the store, what section? I’m glad you liked the chocolate chip cookies!! As for the cookie butter, Ive always found it in the same section as the peanut butter. If you can’t find it in stores (though all three of my local supermarkets carry it so I don’t think it should be too hard to find), amazon carries it too, but it is a bit more expensive there. 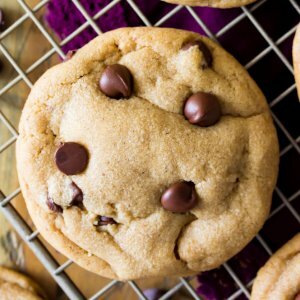 Sam, This recipe sounds delicious, and I am always happy to try another recipe for chocolate chip cookies. However, where would I be able to find “Biscoff Cookie Butter”, because I have never noticed this particular ingredient on the shelves of my favorite grocery store. Thanks! Hi Valerie!! My local supermarkets all carry it right next to the peanut butter, some stores even have their own brand (Trader Joe’s does and my local Giant carries a “Speculoos” butter, which is the same thing). If you can’t find it, Amazon does carry it too, though it’s a little bit more expensive from Amazon from what I’ve seen.